Today Pam and I organized a client’s food pantry. I thought I might share with you some ideas to get you motivated to clean out your own pantry so that you have a fresh start this summer. 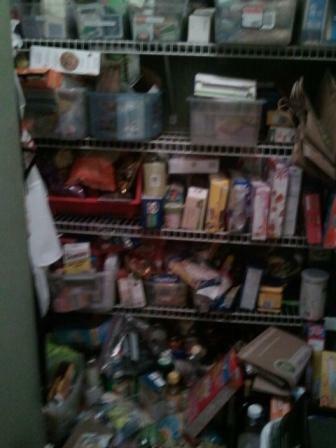 First, we took out everything from the pantry and began sorting and separating the items into similar categories. For instance, we put chips together in one section, cookies in another, etc…. Once everything was out of the pantry we began the process of checking the expiration dates. Everything that was expired went into the trash. If the expiration date was soon approaching we let our client know so that she could use the food item soon. Those items could also be placed near the front with similar items behind it according to the expiration date. When to many of one food item is discovered it is always a good idea to donate to your local food pantry. Next, we put categorized items into plastic bins and labeled them. This will make it easy for large families with children so that everyone knows where everything belongs. A place for everything and everything in its place, right? Another thing we did in the food pantry was to move some non-food items out and we found some new homes for those. Today we moved a crock pot, chip and salsa tray, and fondue set out of the food pantry, thus making more space. Of course there are many different ways that you could organize your food pantry, but I thought I would share with you the process we did today. 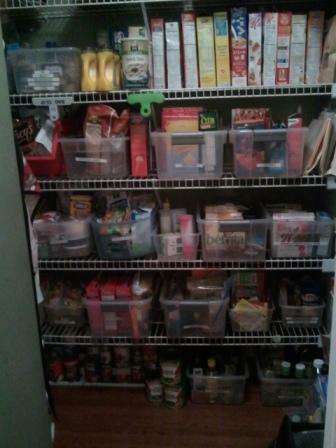 This entry was posted in Residential Organizing and tagged DIY, DIY organizing, Kitchen Organizing, Organizing a Pantry. Bookmark the permalink.